The government's strategy for tackling knife crime has been condemned as "inadequate" by a former chief inspector of constabulary. Sir Denis O'Connor said the Home Office policy document on serious violence was "more concerned with its narrative and less with action". He told the Home Affairs Committee it contained "almost nothing" about the victims and locations of violent crime. The Home Office said it was "deeply concerned" by rising knife crime. It said the government's Serious Violence Strategy, published last April, set out the need for "robust law enforcement" and "a greater emphasis on preventing a young person from taking a knife out on the streets in the first place", with £22m committed to early intervention projects. But Sir Denis, a former Surrey chief constable and assistant commissioner at the Metropolitan Police, said key elements were "absent" from the paper. While he said it contained "quite a lot about offenders", there was a "gap on victims" and it was "silent on deterrence". He added: "Kids are dying and if was one of their parents I would want to give them something that looked like it could get up, wash its face and do something." Sir Denis also said the decline in the number of officers meant there had been a "significant" reduction in the deterrent effect of the police, at a time when their workload from high-harm crimes such as domestic abuse and sexual offences had doubled. 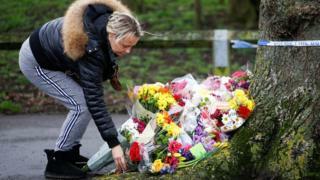 Officer numbers in England and Wales have fallen by around 20,000 since 2010, while the number of knife crime offences reached a nine-year high in 2018. Last week the government promised police forces an extra £100m to help tackle knife crime. Mourners at St Anne's Cathedral in Belfast gave a standing ovation for Fr Martin Magill.